You select the card value, personalize your message, select shipping options and your gift cards are delivered anywhere in the USA with your personal message. Cards valued in US Dollars. Conveniently deliver a Mitchell's Fish Market dining experience by email and save on shipping charges. Great for a last minute gift or choose a date of delivery for any special occasion. eGift Cards valued in US Dollars. For orders over $500 contact us at 1-855-328-5781 option 3. Learn more about bulk gift card purchases. To receive points for online gift card purchases, provide your member number at check-out. Points will be added 5-7 business days after the order is processed. Points are not earned when a gift card is redeemed. 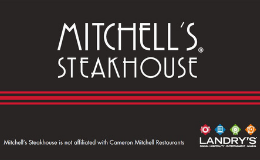 Points are only earned with the purchase of a gift card or for any portion of your bill that is paid in cash or credit card.